But that was 1975 and the art world has passed a lot of water since then. 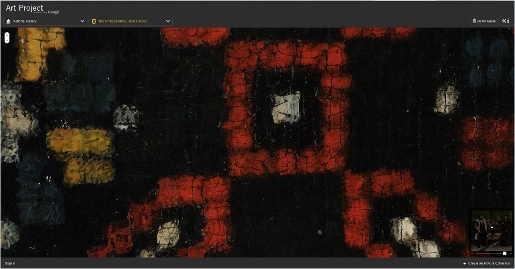 In the ensuing twenty years the cultural institutions expanded in size, wealth and power until, tag teaming with the art market, they seemed to have a complete stranglehold on the entire cultural debate and dissenters like myself had long been kicked aside. Previously the institutions had collected and presented artefacts that had come into existence out in the world, now they incestuously manufactured their own, artists made art for the institutional world alone and the institutions and the art market promoted only the work which supported and promoted their power. But then, suddenly, everything started to change because the internet came along. What the internet provided was an almost free distribution mechanism that could potentially reach anyone in the world, a far greater reach than any institution. Most important of all, the internet had no gatekeepers and the key to the institution’s power was their usurpation of the role of cultural gate keeping – either you played it their way, limited yourself to the forms and issues they found acceptable, or you were locked out of the game entirely. On the internet, however, suddenly all the barriers to entry were gone. Although there are innumerable people out there who still don’t get it, the reality is that the art world has been stood on its head and increasingly the galleries and institutions position resembles that of big box retailers in an age of online shopping- their audience may drop in occasionally to get a sense of the physicality of the objects but the really enhanced experience is online where you can get infinitely more information and even view the object more comfortably and in greater detail. All of that was in our minds as we set about this project. The institution had its priorities and we had ours, how could we both get a reasonable result out of this? The solution to some degree was to use exactly what had been the original criticism of the project back in 1975 – we treated it like a trade show. In other words, we treated it as a form of advertising for something that was happening somewhere else – the sustainable farming movement that has built up around P A Yeomans work – and we produced a range of merchandise for the occasion. Hence the prints. 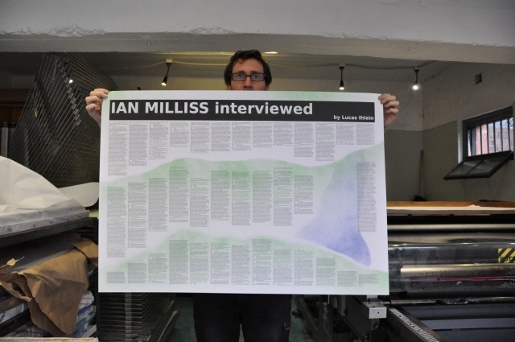 There are six prints: two by me, two by Lucas and two by Yeomans, so to speak. 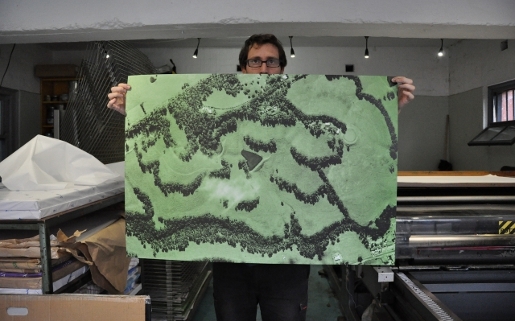 The first “Yeomans” print is based on the Google Earth view of Nevallan, the property we visited early in the project. 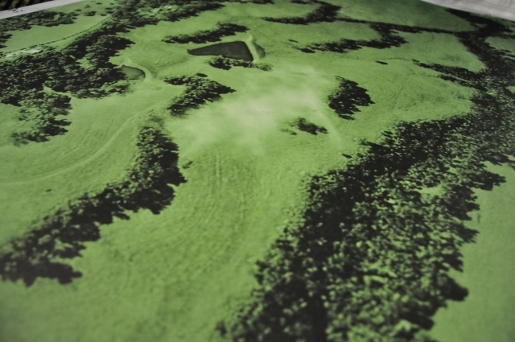 I rotated the image to place the river parallel to the bottom of the frame but other than that it has only been manipulated by printing it as a duotone. 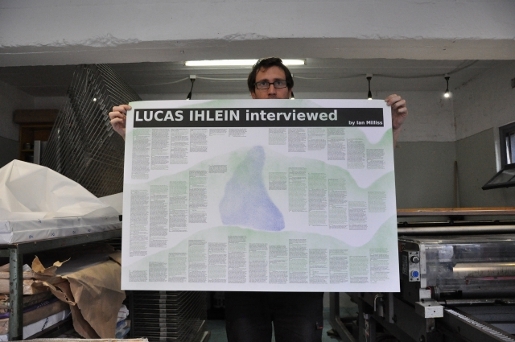 The second and third prints, which I produced, are the interviews Lucas and I did in which we each discussed the development of the project in term of our personal artistic histories. LouiseTheIntern (Louise Anderson) while helping with the printing rather cruelly observed that when I was being interviewed I gave lengthy answers and when I was doing the interviewing I gave lengthy questions so that overall there is much more of me talking than Lucas. Sadly, that is completely true and my only defence is that I talk too much and Lucas is too polite to tell me to shut up. In terms of design, I have spent far too much of my life laying out newspapers and magazines where I had to align every last column. In this case, I didn’t. 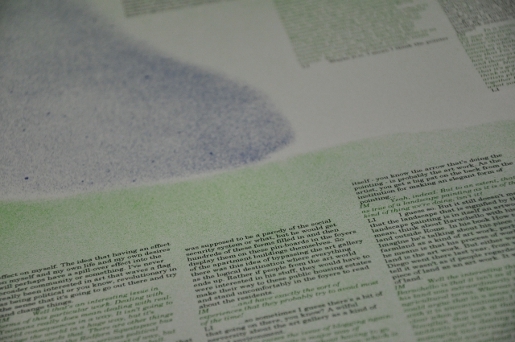 In fact I ignored almost every conventional print nicety because just for once I could and guess what, it hardly makes any difference to the readability or lack of it. The contours and dam shape are based loosely on illustrations in Yeomans books and have been sprayed over the finished print using stencils in a sort of gentle parody of the artists’ authentic touch – yes folks every single one has been graffitied by me. The fourth print is by Lucas but is not a print at all and we don’t even have photo of it although you can see it in the background of the exhibition photo in the previous post. It is in fact the original that will be made into a print because in the rather haphazard tradition of this project Lucas’s partner Lizzie gave birth to a daughter Alberta May only two weeks before the exhibition and just when the print was to be produced, which was a bit of a distraction. It is a diagram illustrating some of the ideas of Stuart Hill, Professor of Social Ecology at the university of Western Sydney. Stuart has written extensively on Yeomans and has developed many of his ideas in innovative ways. We’ll talk more about his work later. 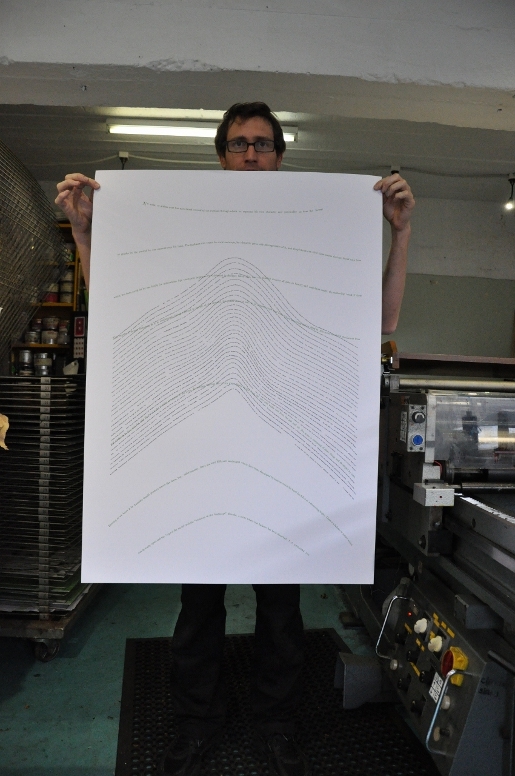 The next rather beautiful print is by also Lucas, made by cutting and pasting, word by word, quotes from Yeomans books over one of his keyline contour drawings. It’s my favourite of the prints I think. 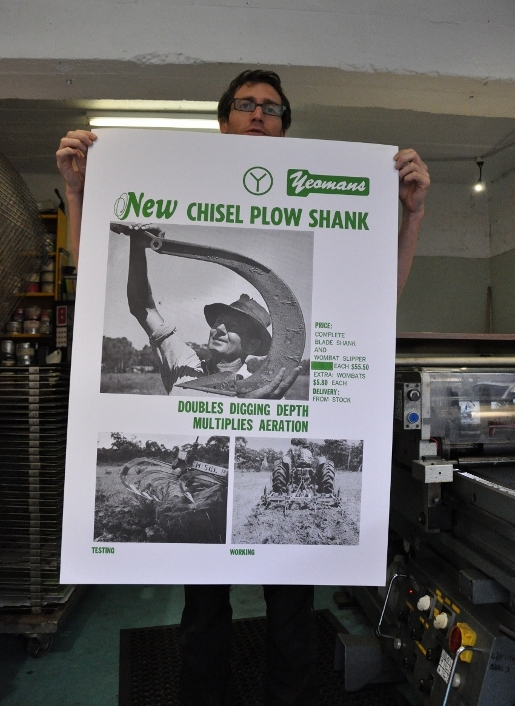 The final print is Yeomans again, it’s an enlarged page from the 1970s sales pamphlet for his plows, in this case advertising one of his specialised tynes but very much in the optimistic mode of that era when everything still seemed possible. 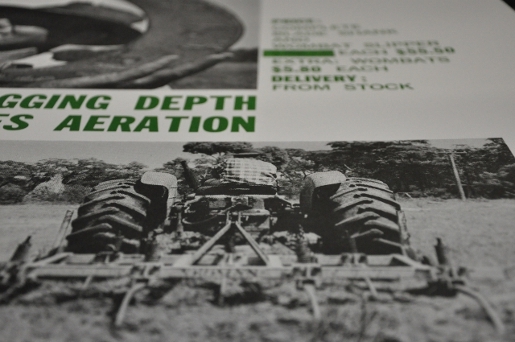 It includes an image of an earlier version of the plow we feature in the exhibition and the plow deserves a discussion all of its own. So there it is our merchandise, our collectibles. We thought of doing some Tshirts because you’ve always gotta have Tshirts, we thought of mugs, then we thought no, stay classy, it’s an art gallery, make it look like art – whatever that is. This entry was posted in Art, History, Politics and tagged ACCA, Big Fag Press, Ian Milliss, Lucas Ihlein, Nevellan, PA Yeomans, What Didn't Happen. Bookmark the permalink. Post a comment or leave a trackback: Trackback URL.